These last few months have been a meteorologist’s playground. We’ve had some Spring, quite a bit of Summer, the occasional dash of Winter. Personally, I have very weather specific preferences where food is concerned. We’ve done a lot of raw and crunchy in anticipation of summer, but yesterday here in Central Maryland was pretty dreary. Not quite cold, but most definitely cool. And it rained ALL day. The dog kept looking at me as though I should do something about it now, please, as he really prefers to go out in dry weather. I stayed indoors much of the day as well and felt a sort of grey chill all over. 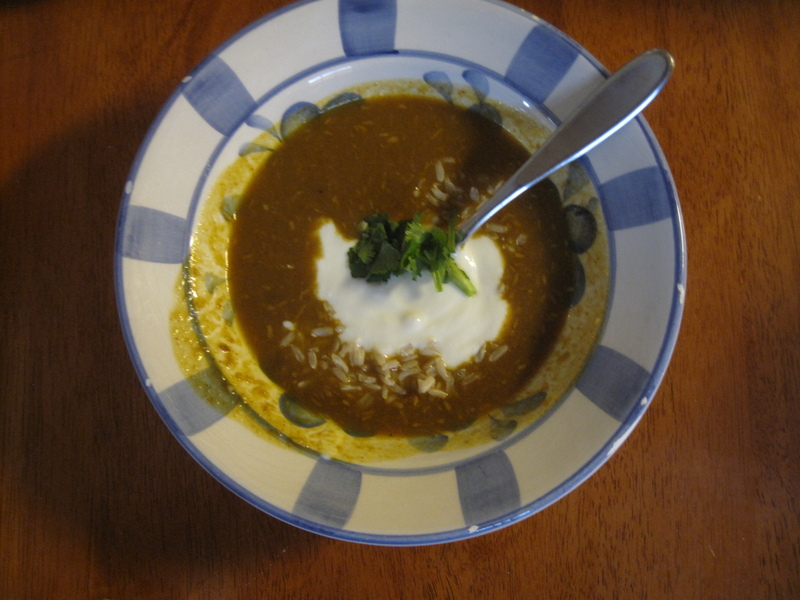 And so, as a farewell to cooler temps I whipped out one of our favorite soups… mulligatawny. In case you’ve not had it, mulligatawny is what my son refers to as “curry soup,” as that is the primary flavor in this delicious meal. It is a little spicy, but because it also has coconut in it, has a delicate sweet side that is irresistible. Some add chicken or shrimp to their mulligatawny, however, the pureed vegetable base is the key to this Indian delight. Last night I challenged myself to make the soup as veggie friendly as possible without losing the fundamental depth, and I won. So I will share with you the curried fruits of my labor… great tasting and good for the ticker, especially on a gloomy day. Combine spices. Melt or warm coconut oil in large pot on low-med heat. Stir spices in and saute until they smell awesome. Add onions and coconut and cook until soft (around 5 mins). Add garlic, ginger, and tomato paste and cook for another minute or so. Add flour and stir until ingredients are combined. Add broth and stir well, being sure to clean bottom of pan with the broth to get all of the spice. Add carrots and celery and bring to boil, lower heat and simmer for about 20 minutes (until carrots are soft). Puree however you like (I used a stick blender because I hate all of that pouring back and forth, but a blender will give you a cleaner puree and will do a better job on the coconut). Add lentils and bring to boil, reduce heat and simmer for 30-40 minutes. Salt and pepper to taste. We spoon rice into the bowl, add soup, a dolop of yogurt and a sprinkle of cilantro. Delish. Sending warm weather your way! We have 90 degrees here today! I could eat soup any day of the year, for some reason I thought mulligatawny was a seafood dish. I’m delighted that it’s not because one can never have too many curry soup recipes! It’s actually much warmer here today, too. But that soup sure hit the spot last night. The Soup Nazi strikes again. Sounds delicious! Can’t wait to try it. Thank you. So much goodness to share! Mulligatawny is one of my favorites! Me too. So deeply satisfying. Thanks for stopping by! I’ve been looking for a new dish. I am also trying to be more healthy. This dish will work nicely. Delighted we could help Garrett! Let us know if you try it! I used to love this soup as a kid! Haven’t had it for years – thanks for the reminder! Yay! That’s happened to me a couple of times recently – some foods I almost forgot about completely. Aren’t blogs grand? Thanks again, Jill! One of my all time favourites. Good looking recipe. So delicious, especially when there’s nasty weather. Thanks for stopping by! Sounds good! Will have to pin this to try this winter! Thanks for sharing…blessings! My pleasure – thanks for stopping by, and yes a great soup for chilly times! Thanks so much! We’ll definitely check it out! I love this soup and I’ve always meant to get a recipe for it. Please bring it by foodie friday today. You got it! So yummy! I can’t wait to try this flavorful soup, I can almost smell it as it simmers away. Hope you are having a great weekend and thank you so much for sharing with Full Plate Thursday. Yay! Let us know if you try it and thanks for hosting such a lovely link-up! Our pleasure. It is a family favorite over here. Thanks for hosting! Hey there Lisa. I’m actually in Frederick – so probably not so far from you at all. Thanks for stopping by! Your soup looks delicious! Thanks for sharing it with the Hearth and Soul Hop. Thanks so much for sharing at Wednesday’s Adorned From Above Blog Hop. This weeks party starts at 12:01AM on Wednesday and runs through Sunday night. Have a great week. Just wanted you to know that your wonderful soup is being featured on Foodie Friday today. Stop by and get your featured button. I will be tweeting and pinning it this week. YAY! Thanks Diane! Such a treat to be featured on a lovely link up! Ready to Change? Our book will show you how! This Tofu is to Die For! Sugar Back on my Back and the easiest ‘Sweet’ Treat Ever! Take a Step! Grab our Button!